How do you know that what you're giving to your market is unique? How do you know that you can differentiate yourself from the competitors? Well, there are a couple of things that I'm going to share with you today, that'll going to help shift your perspective on how you're positioning yourself so that you can get more clear, and define how you're different than the rest of the people in your market. The first thing we have to focus on are these three parts: your philosophy, your methodology, and your tactics. The first thing we have to break down is the philosophy. Just ask yourself, "what it is that you stand for?" For us, we understand that our whole philosophy is based on maximizing performance. We have a performance maximizing philosophy that allows us to not only focus on online sales and offline sales but also infrastructure and employee hiring. There's also scaling and inside systems development too. There are a lot of things that go into maximizing production and optimizing performance. That's what we want to focus on, so for us, what we do is we have online, which is PPC, email, social media, SEO and joint ventures, etc. We also have systems for cold calls; live events, direct mail, referral systems, and off-line joint ventures. There's a lot that we can help set up for our clients because we don't only rely on one area of customer acquisition. Our philosophy isn't maximizing the digital space. Our philosophy is performance maximization. When we have everything lined up with offline and online tactics, now the tactics now come into play. We have our philosophy, we have our methodology, and then we have how we're going to deploy it. What we have here are different variants of ways for you to bring in new clients and customers, and for us to focus on performance. Once you figure that out, then you can start to build downward, the way I'm going to show you in the video. Once we have the philosophy created, then we have our methodology, which is our VPC method. A lot of the business owners and entrepreneurs are not doing the necessary work before they ever make the sale, so hence sales are low. What must get done beforehand, is you must deliver value, goodwill and build up some sense of care for your market. If not, you're just coming off like everybody else. ... and why would they go to you, if you can't differentiate yourself? They won't. Especially if you sound like everybody else, and you don't know your philosophy. Our methodology is value, pitch, close. 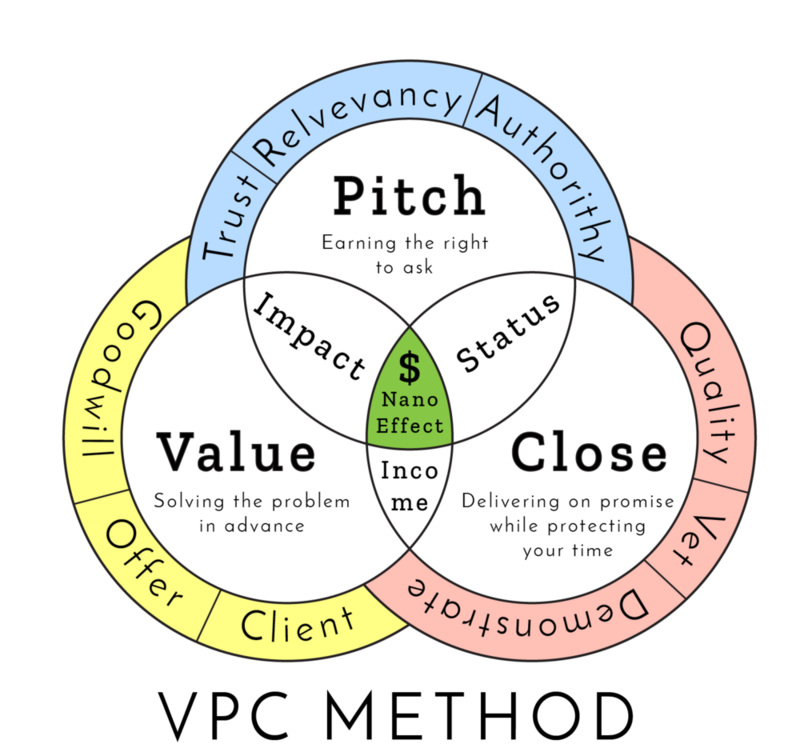 We must create the value to earn the right to pitch. Once we earn the right to pitch, we must have the skillsets to close. If any of the steps are missing, your ability to maximize performance goes down the drain. The next question becomes: "How do we use the tactics to get this all to work and be successful?" For us, what we created something we call "nano-targeting." Nano targeting takes micro-targeting to a whole 'nother level. Without over complicating it for you, here’s what nano-targeting does. It's a specific geographic and behavior based targeting approach designed to give the most value and the best experience to your cold market so that you can shrink the sales process by over 500%. This works extremely well because we know that most people are purchasing between day ninety to two years out. Following the method, we can shrink that approx. 5X by giving them the opportunity to get to know, like, and trust you, in a fashion that gives them an experience where they don't feel bombarded. People hate the advertisements that come through Facebook™ or Instagram™, or through YouTube™ that are "buy now, buy now, buy now." What if we could deliver value to them, without anything in return? Something like, "Hey, here's something to help you," and then based on their behavior, then we can go ahead and say, "Hey, you know what? Because you said you were interested in this free stuff, you're probably interested in this other thing, which is going to cost you a little bit of time or money, let's go ahead and get you involved." You want to make sure that you're building all your marketing material to support your philosophy. That nano-targeting approach is going to create what we call the nano effect. Once the V.P.C. Method is in place and you begin to experience the nano effect, you’ll be in a position to control these smaller, more intimate segments of your market so you can deliver a higher level of service to them when they need it. Then, as your building, you're going to see that these little buckets are all assets within your business start to form. When that happens, you're going to be in charge. In charge of all the assets you can demonstrate your value to so that you can ultimately position yourself in the market for the long term. Not the quick dollar that a lot of people are looking for today. If instant gratification is your thing, then everything I just shared with you is not going to be appealing. But, if you're somebody who's looking at this going, "Man, you know what? This approach makes sense. Positioning yourself today to be in business in five years seems like a smart idea, so let me go ahead and take maybe another look at this." Let's walk through it real quick. Give you a recap. My company Philosophy is Performance maximization. You must understand your philosophy, the methodology and the tactics. 2. Once you have your philosophy, build your methodology to support that. 3. Develop your tactics to promote your methods. Once you can execute on all that, you're going to be in a great position. Now, if you would like some help with putting all this together, and figuring out how we can get you clear on your methodology, your philosophy, and/or your tactics, then tap here and let's get together for a kickoff call. We'll get you clear on understanding how you can move your business forward. Not incrementally, but we're talking quantum leaps! I hope you found some value today, and I hope you got a better understanding of our philosophy, our methodology, and our tactics.